Salix lucida.Donald Cameron.© Copyright Donald Cameron.New England Wild Flower Society.gobotany.newenglandwild.org (Accessed 8/2014). 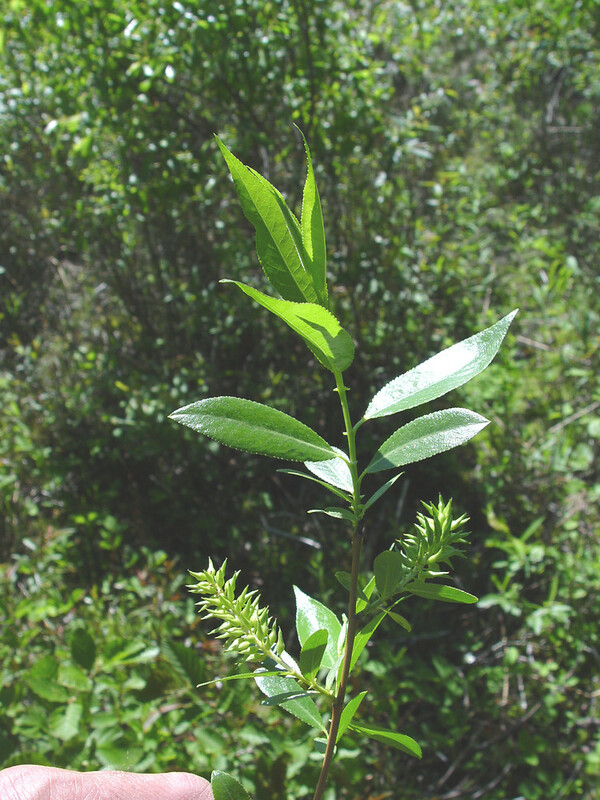 Salix lucida is a shrub to 6 m tall, to 12 cm diameter (dbh), bark brown, smooth, twigs brown and buds shiny brown; young twigs and leaves reddish-hairy; stipules to 0.5 cm, persistent kidney-shaped with glands along margin. Leaves alternate, lance-shaped, to 15cm long 4 cm wide, tip long-pointed, margin glandular-toothed, green on both sides, paler below, leaf stalk to 1.5 cm, glandular at leaf base. Flowers dioecious with sexes on separate plants, in catkins, to 5 cm long, scales yellow, stamens 3-6, blooming as leaves expand, April-May. Fruit a capsule to 0.7 cm long, seeds plumed, wind dispersed June-July. Habitat: Open, moist to wet soil. Prefers soil pH 6-7.5. Tolerant of flooding, drought, salt, soil compaction. Very intolerant of shade (Hightshoe 1988).